Since we’re officially into spring now (yay!) I thought it would be perfect timing this week to share my farmhouse style gallery wall looking all fine and dandy for spring. I first shared this staircase gallery wall last year and it’s honestly one of my favorite spots in our home. It’s full of collected treasures and antiques and many of the items on this wall have sentimental meaning. Everything has a story to tell or brings back a special memory of some kind. It’s really a special little spot. Well over the past few weeks I’ve been adding a few touches of spring here and there to brighten it up for the new season. It’s been such a fun project to work on and I’m excited to show you how it’s looking now! So I left the bulk of what I had originally on this wall in place, but I did add a few new things in for spring. 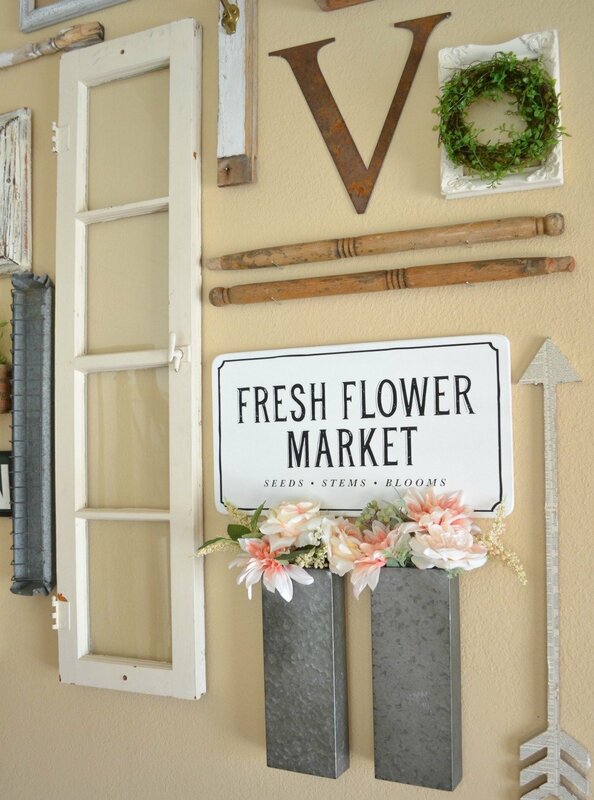 The first was that adorable fresh flower market sign. You guys, how cute is that sign??! I found it at Mangolia Market on our trip a few weeks ago and I knew right away that I wanted to use it on our gallery wall. It was the first thing I picked up! 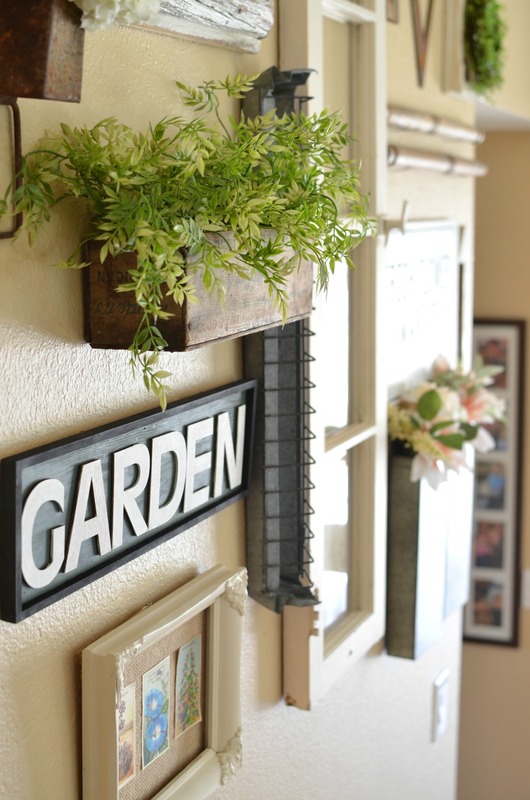 Paired with those hanging metal planters full of purdy springtime flowers, I just love what it adds to this wall. 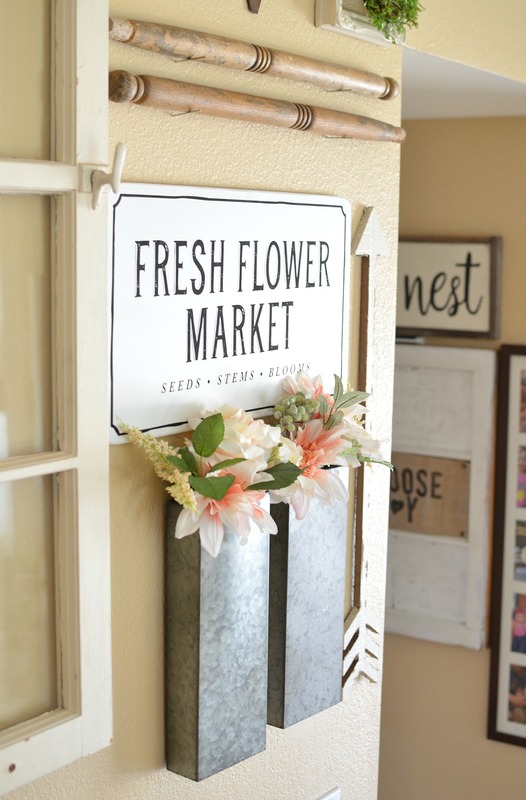 I was inspired to make this little GARDEN sign when we were at Magnolia Market. They had a huge one just like this in the garden shop and I fell in love with it. I thought a mini-version should be perfect for our gallery wall this spring and summer. It was super easy to create. Let me know if you’d be interested in seeing the tutorial, I’m always happy to share! I used a few of my extra vintage seed labels from France on this wall as well. Spot them there in that old frame? I just glued three of them to some burlap and voila! Easy spring-time art in five minutes. The thing I love about this wall is that it’s a collection of things I’ve gathered over the years. I have lots of old pieces and antiques that are sentimental to me, like the chicken feeder (from my childhood home), the brown spindles (from my great-grandfather’s chair), and the coat hook (from a hall tree my father made when my parents were first married). Combined with a few newer pieces I’ve picked up recently, or things I’ve DIY-ed, this wall is full of memories and history. And I have to say, it really is one of my favorite spots in our home. 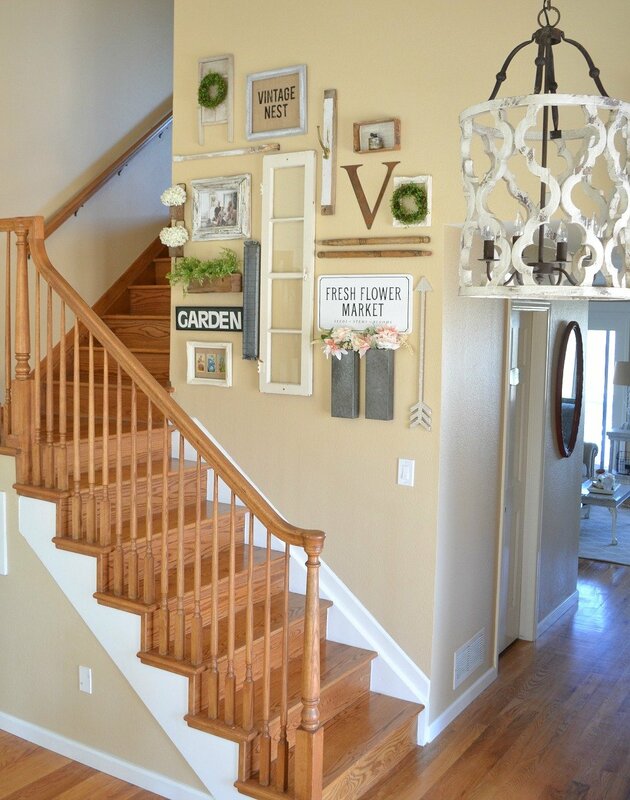 If you have empty wall space in your staircase, or anywhere in your home for that matter, consider gathering up some of your favorite things and creating a gallery wall for yourself. 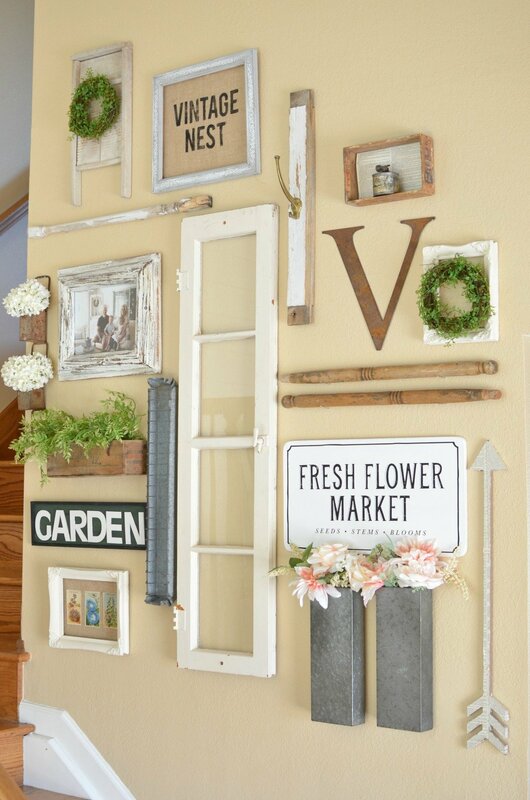 Think outside the box when it comes to what you can include in the collection and don’t limit yourself to the typical wall decor. Get creative and use it as an opportunity to express yourself and showcase the things you love. Thanks so much for being here today, I always appreciate it. 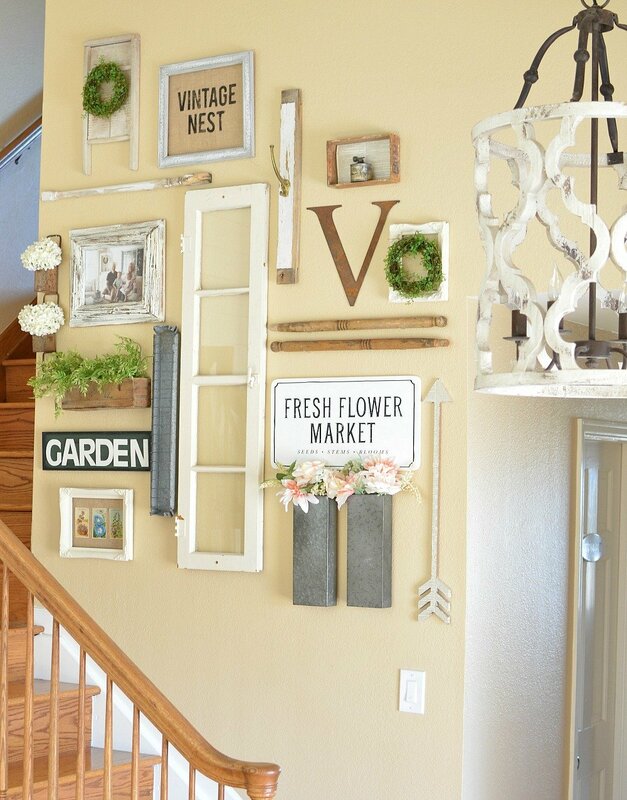 I’d love to hear what you think of my farmhouse style gallery wall for spring. And be sure to ask if you have any questions! Really….really pretty! Love it! Look forward to reading your post every day! Thanks for sharing. Thanks Jan, so glad to have you here every day! Love your wall. So fresh looking. 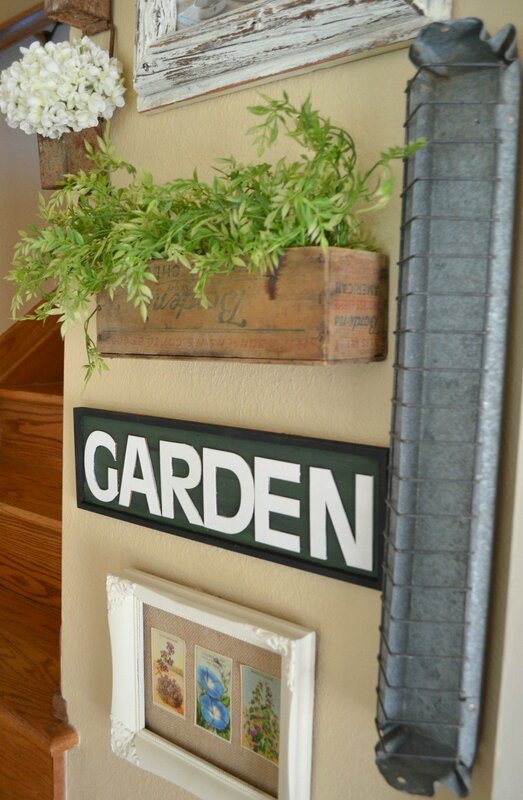 Would love to see how to make that garden sign. I have a perfect spot for it. Thanks. Thanks Tammy, I have the GARDEN sign on my to-do list so stay tuned!! Very cute Sarah! And very much a welcome sight for Spring following a cold, sleepy winter world. 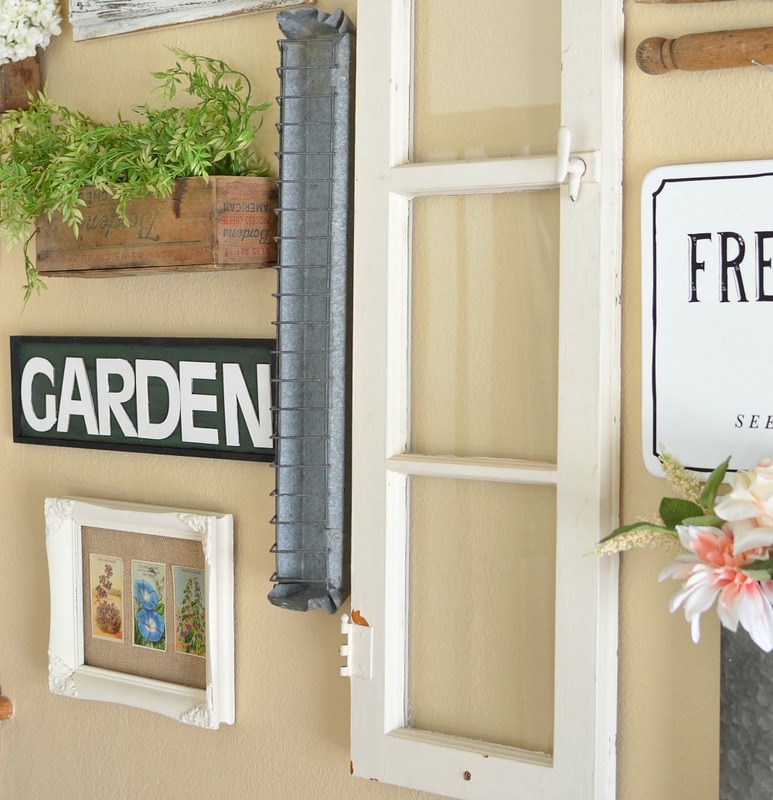 Love the finds from Magnolia Market and yes, cute Garden sign! I can think of the perfect spot in my home for one if you wouldn’t mind showing a tutorial. How neat that you have such a collection of wonderful things to spotlight and share and remind you of the wonderful people you love! Thanks so much Jana. And I’ll plan on sharing that GARDEN sign tutorial soon. Looks like a few others want to see it as well! Love the seed picture and will be using that idea when I start decorating my new garden room…..found some awesome vintage seed packets that I am using in a project but will be keeping some out to frame….I like the idea when your able to place pieces in your decor that have such found memories……you can walk thru your home and go down memory lane………..
Oh that’s awesome! I love vintage seed labels, I have a new found obsession with them. That’s for stopping by today JB! Ohhh no Helen! Sorry to hear you’re getting rain and cold in the UK. It’s been so nice here in Colorado the past few days but I hear we are supposed get up to 5 inches of snow on Friday. Yuck! Our styles are always evolving it seems. But I’m with you on the less is more thing–I’m all about simplicity! Thanks for dropping by the blog today Ruth. Looks great! Love the seed packet picture. I buy seeds in bulk because I have about an acre truck garden but I know I have some old flower seed packets somewhere. Thanks for the inspiration! Of course, so glad you stopped by Sally! I love your wall as well Sarah! It has inspired me to find some treasures over the past year to use in my home. I would love to see the Garden sign tutorial as well. I’m sure I could find a spot for it. ???? Thanks Donalee, looks like a few others want to see that tutorial too so I’ll plan on sharing it soon! Thank you so much for all your posts….you have inspired my decorations in my home. We just moved and I have the entire house to decorate. Keep up the great work…I love the wall! Thank you, it’s so much fun to share my ideas! And congrats on moving into a new home–that’s so exciting. Good luck decorating! Love the ideas! Would love to see the garden sign! Thanks Jessica, looks like several want to see how I made the GARDEN sign so I’ll plan on sharing that tutorial soon! The fact that your gallery wall has such meaning is the best part! The extra spring florals and greenery take it over-the-top-adorable! I can see why it’s your most favorite. I think out of all of the gallery walls I’ve seen on Pinterest, it’s my fave too…even over the antique mirrors and windows! That’s saying something girl! Hope you have a marvelous day. Dang Cindy, that’s a great compliment. Thank you so much!! I love this wall in so many ways! I’ve always loved wall galleries. You have a real gift for styling here, Sarah! Thanks for the inspiration. Hope you are feeling well! I really appreciate that, thank you Julie!! Good question. That’s an old chicken feeder from my childhood home. I grew up raising chickens, so it brings back special memories of simple days on the farm! I love your gallery wall! The pieces are beautiful, unique and it’s cool to hear the history behind them! I just started a gallery wall and I am so glad you said to think outside the box and gather your favorite pieces. I can so easily stay inside the box and do what’s normal. So thank you for sharing yours! Just curious where did you buy your green mini wreaths? I got those mini wreaths from Michael’s! I bought several, LOVE them. Thanks for dropping by today Stacey and good luck with your gallery wall. 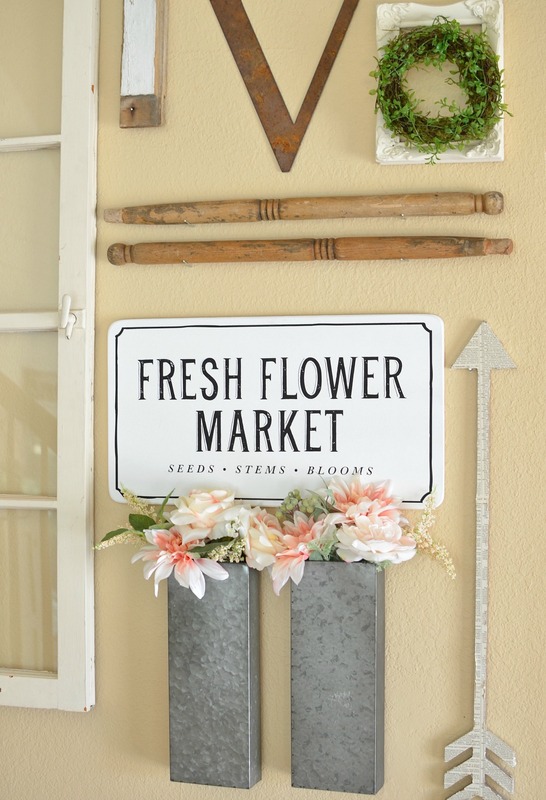 How adorable is that Fresh Flower Market sign from Magnolia?! I have part of a gift card left to there that I received at Christmas, and I just may have to order that for myself. 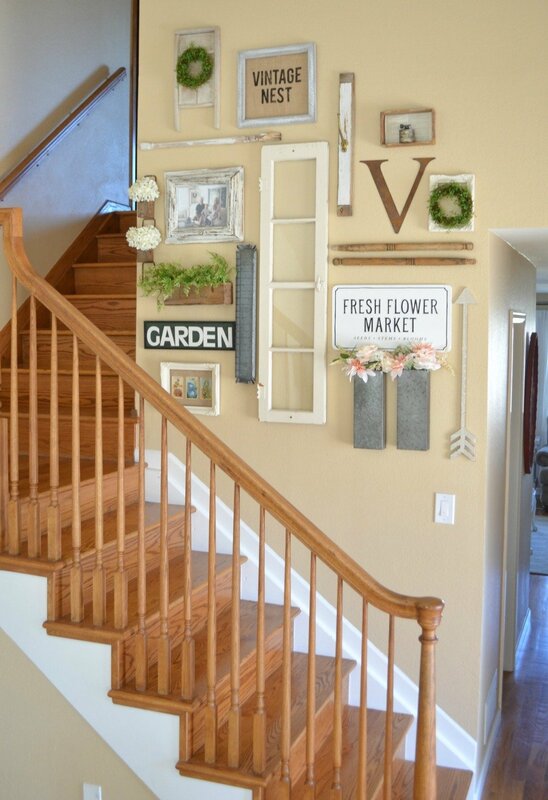 You’ve inspired me to get to work on our own staircase gallery wall and just generally freshen up the house for spring! hahaha yes go grab yours Margaret! I love your gallery wall. Where did you get the arrow. I love it and how everything has a meaning. Hi Michelle, that arrow is actually from Michael’s. Looks great. Can I ask what color the walls Are looking for this exact color: thanks! 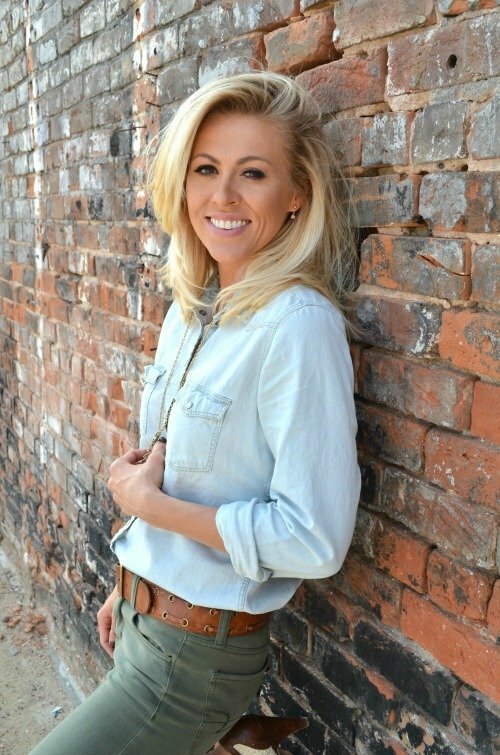 Hi Jill, the color is Autumn Blonde by Sherwin Williams. Oh yay Teresa, congrats on your new place! I have recently retired, don’t have the decorating “gene” but love a pretty and well-organized home. I also love your posts! I’m finally ready to do a gallery wall. Hope to add my grandmother’s pedal sewing machine to the smaller adjoining wall. I want to incorporate a 20×16 black and white family photo, as well as other smaller family pics. 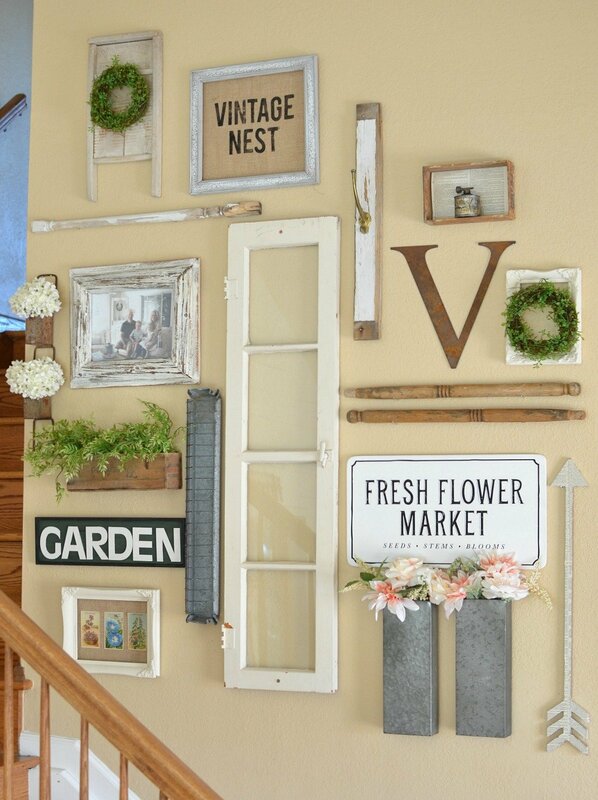 I’m also planning to add a “Family” script sign painted on a pallet board, a couple of tea lights in small jars mounted to distressed wood boards, and want to try a plant. Additional ideas and/or pics for a 13′-14′ gallery wall over a piano? Pics would be wonderful! Hi, where did you get that light?